Will gold sustain its spectacular rise? Gold prices have been rising over the past few months and show no signs of any significant fall in the imminent future. A decade ago, the price of gold was near $250 per ounce and today it is over $1500. The yellow metal rose about 25 percent in 2010. 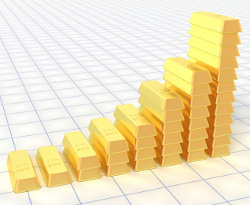 The price of gold is expected to touch $1750 or even more by the end of 2011 and analysts advise investing in the yellow metal to stabilize your investment portfolio. There are some variables which cause the price of gold to increase and these include weakening of the dollar and other prominent currencies, apprehensions of inflation, safe-haven buying, and fluctuating energy prices. The falling dollar has been pushing up the price of gold to new heights as also the political climate in the United States. The economic situation of the country gives no cause for celebration and this makes investors reluctant to invest in government bonds and other such securities. Civil unrest in different parts of the world has also been a contributing factor to the meteoric rise of gold prices. Combined with the massive natural disasters which have been seen in recent years, gold is seen as something that can help protect one's assets. Demand for the precious metal in China and India has been increasing and people are investing a lot of money in gold in these countries. Both Asian countries are doing well on the economic front and as long as they stay strong on this front, the demand for gold will remain thus causing prices to stay up. Central banks of these nations as well as others like South Africa, Russia, and Argentina, have been stocking up on gold in lieu of their cash reserves. China's gold imports in 2010 were about 500 percent higher than the previous year. Mining for gold is becoming an expensive proposition and no new sources are being discovered. Costs of technology involved in extracting from difficult locations and various environmental costs are worsening the situation. Most experts see the rapid rise in gold prices supported by fundamentals and not simply speculation. At the same time they also opine that a correction is long overdue and this will help sustain the bullish trend for some more time. Even then, gold is seen as a volatile investment that can either move up or down at a moment's notice. Silver was also considered a good option but the recent crash has brought about uncertainty and preference is being given to gold. The per ounce price of gold is inversely proportional to the value of the currency in which it is valued. During inflation when the value of the currency decreases, the price of gold shoots upwards. The actual rate of inflation can differ significantly from inflationary expectations. However, the movement of gold is related top both these figures equally. So, even if the figures do not show marked increase in inflation, expectations can cause gold to stay up. Once gold prices rise on such expectations they do not come down immediately even if inflation stays below expectation. It all really hinges on the mood of the investors and their view of what might happen in the near future. It is expected that the inflation seen in India and China will offset the deflation in the United States. Deflation means federal interest rates will remain low and this will again contribute to the growth of gold prices. This means that as long as the dollar stays weak, gold will continue to peak in 2011. There is a segment of analysts who maintain that gold is not to be seen as an investment. They argue that it does not create value or income over time and must only be considered for speculation purposes. For those who are seeking to buy gold as protection from inflation, they suggest investing in rental real estate. Figures indicate that buying gold in the form of jewelry has declined as compared to buying the metal for investment and speculative purposes. This change has come about in the past decade and skeptics maintain that the last time such a trend was seen was in the 1980s when the lure of gold crashed. Hence, the advise to get out of gold while the going is good. Over the course of history, rapid rises in the prices of commodities have eventually crashed just as suddenly. Ten years is seen as a good run and many anxiously look for signs that the gold bubble is about to burst. To a certain extent, the hype created about gold is responsible for the steep price increase. Hence, the moment the hype dies down, prices will also fall. The 'safe-haven' appeal of gold is also fast decreasing in the wake of the weakness it displayed in times of recent turmoil. The tsunami which devastated Japan might well spell the downfall of gold. Japan was a major importer of gold and following the tragedy, there has been a void in the demand. This, in turn, means that supply is more than demand and there is a surplus of gold available. Also, with silver becoming cheaper than gold more and more investors are likely to turn to the white metal. The dollar will not stay weak forever and as soon as it strengthens, gold prices will move inversely.